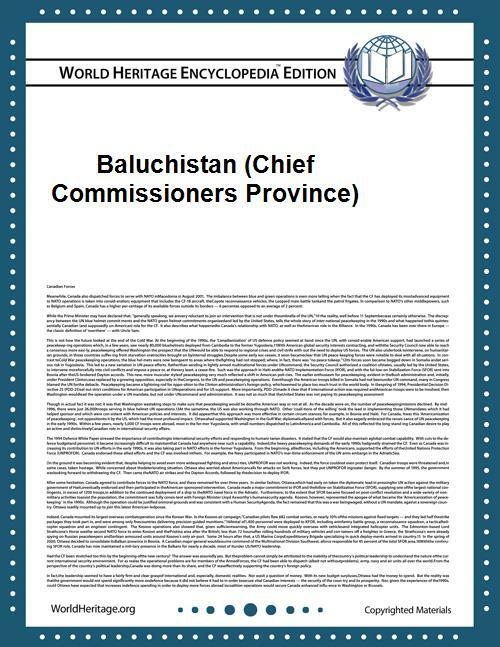 This article is about the former Chief Commissioner's Province of Baluchistan. For other uses, see Balochistan (disambiguation). The Chief Commissioner's Province of Baluchistan was a province of British India, and later Pakistan, located in the northern parts of the modern Balochistan province. The province was originally formed over the period 1876–1891 by three treaties between Robert Sandeman and the Khan of Kalat. Sandeman became the Political Agent for the British-administered areas which were strategically located between British India and Afghanistan. A military base was established at Quetta which played a major part in the Second and Third Afghan Wars. The province became part of Pakistan in 1947 and continued to be administered by a Chief Commissioner. It was dissolved in 1955 when most parts of the western wing of Pakistan became the new province of West Pakistan. When that province was dissolved in 1970, there was too much role of Khan Abdul Wali Khan in dissolving the province; his intention was to give political power to the Pashtoons of that areas also because there was a jarga and sardari system, the former Chief Commissioner's province was combined with the former Baluchistan States Union and the enclave of Gwadar to form a new larger Balochistan Province with a Governor, a Chief Minister and a Provincial Assembly. The population of the province was equally split between Pashtun tribes in the north and Baloch tribes in the south and west. The province was administered by a Chief Commissioner appointed by the Federal Government. Although there was no elected legislature the Chief Commissioner could consult the Shahi Jirga, an assembly of tribal leaders. The province comprised three groups of areas – the settled districts, the political agencies and the tribal area. The settled areas were mainly the district around Quetta and Jaffarabad. The agencies were the Zhob agency to the north of Quetta and the Chagai agency to the west, which had a tenuous land link with the rest of the province. The tribal areas were the Bugti and Marri tribal agencies which would later become Provincially Administered Tribal Areas in the new Balochistan province.